If you're not factoring real-time geospatial analytics and mapping into your GIS strategy, you're leaving an immense gap in your ability to truly understand what's going on, why it's happening, and how you should respond. Later this year, Esri will unveil the ability to deploy Real-Time GIS as a managed service, enabling you to reliably ingest, analyze, and store millions of sensor events per second. You will be able to quickly visualize, replay, explore, and perform fast batch analytics on billions of features. Currently, Esri offers Real-Time GIS capabilities via ArcGIS GeoEvent Extension for Server, which can be deployed on-premises or in the cloud. Ready-to-deploy images of ArcGIS for Server, including ArcGIS GeoEvent Extension for Server, are available via ArcGIS Server Cloud Builder on Amazon Web Services and for Microsoft Azure. GeoEvent Extension is currently used by hundreds of organizations across numerous industries, including agriculture, government, natural resources, transportation, and utilities. The number of connected devices is rapidly increasing, and those devices are producing exponentially more data, creating a demand for higher data ingestion rates and faster analytics. 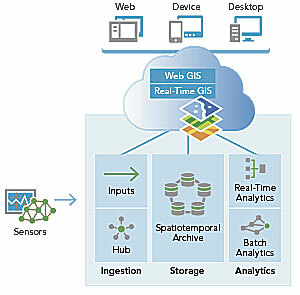 While on-premises Real-Time GIS can process thousands of events per second—a rate that meets the requirements of many organizations managing small fleets of vehicles or sensor networks—the new Real-Time GIS as a managed service will reliably ingest, process, analyze, and store events that range from the tens of thousands to millions per second. That's fast enough to support smart cities the size of Los Angeles or London. It's fast enough to monitor all the sensors and smart meters used by major water, oil, gas, and electric utilities. It can efficiently track and analyze the movement and disposition of large fleets of trucks, ships, and aircraft, which are essentially moving sensor warehouses. You can use Real-Time GIS to ingest real-time data streams from in-vehicle GPS devices, sensors, mobile devices, and social media providers. It accommodates multiple streams of data flowing continuously through filters and processing steps that you define so you can focus on only the most important aspects of your operations. It can track dynamic assets that are constantly moving (vehicles, aircraft, vessels, and people) or stationary assets that have attributes that constantly changing (pressure valves on a pipeline and weather monitoring stations). This new Real-Time GIS as a managed service offering is composed of a distributed computing architecture designed to support the processing speeds and volumes of data produced by an emerging constellation of connected devices and sensor technologies. This technology will be offered through Esri Managed Cloud Services. Esri will provide customers with ready-to-use instances of ArcGIS running in the cloud that can be easily scaled depending on your requirements. You can choose a cloud provider (initially Microsoft Azure and Amazon Web Services) and will be able to choose the cloud deployment region. 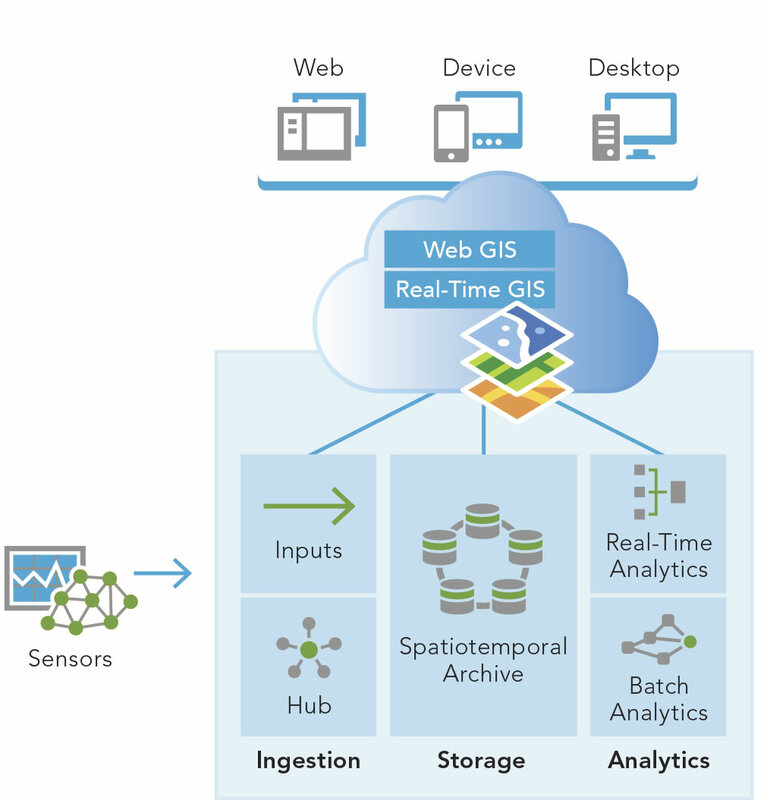 Real-Time GIS as a managed service leverages multiple aspects of the ArcGIS platform including web GIS, real-time, and batch analytic capabilities that work with the spatiotemporal big data store. The Spatiotemporal Big Data Store is a central component of Real-Time GIS as a managed service. End users will be able to interact with the observational data stored in the spatiotemporal big data store using standard ArcGIS clients such as ArcMap, ArcGIS Pro, and web maps. Rather than display millions or even billions of points on a map, data can be aggregated on the fly for more effective visualization. When the new Real-Time GIS as a managed service becomes available later this year, you will be able to reliably ingest, process, analyze, and store millions of sensor events per second. You will be able to visualize, replay, and explore extremely large datasets and perform fast, coarse-grained analytics on billions of records. Since you will be able to specify the region to deploy based on a selected cloud provider, you will be able to run continuous real-time analytics on nearby data with faster, more local access.